The birth of Lord Ganesha birth can be regarded as interesting as any story could be. Ganesha was born unknown to Lord Shiva. Goddess Parvati needed someone to guard the chambers while she was taking bath. It happened in the past that Shiva devotee allowed him access when she did not want this to happen. So, She made a figure with turmeric paste and put life into it. Then she asked the boy, Ganesha not to allow anyone to enter the house. Ganesha followed his mother’s orders to the word and did not allow Shiva any access to the house. 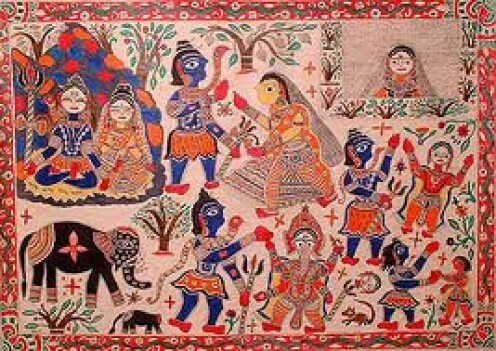 Note: Madhubani painting is popular folk art form. Shiva got angry and asked his followers to attack the boy. But they were conquered. Shiva got surprised. Realizing that this was no ordinary boy, Shiva decided to fight himself, and in his divine fury cut Ganesha’s head, killing him quickly. When Parvati came to know of this, she was so angry that she decided to destroy the whole universe. But Lord Brahma pleaded that she reconsider her intent. She said she would if two conditions were met: One, that Ganesha be brought back to life, and two, that he be forever worshipped before all the other gods. Brahma also suggested that he replace Ganesha’s head with the first living being that came his way with its head facing north. Shiva then sent his followers to bring the head of a creature they happened to find sleeping with its head facing north. They found a dying elephant which slept in this manner, and after its death took its head. Shiva attached the elephant’s head to Ganesha’s body and brought him back to life. Ganesha is worshipped by everyone before beginning any puja. Another less popular story of lord Ganesha’s birth as written in the Brahma Vaivarta Purana. Eager to have a son, Parvati decided that she would keep a year-long fast to appease lord Vishnu. At the end of her fast lord Vishnu was duly appeased and gave her the boon of a son. In some stories, the son is a reincarnation of lord Krishna, another prominent Hindu deity. On the joyous occasion of the birth of their son, whom they named Ganesha, Shiva and Parvati invited all the gods to their abode in Mount Kailash to look upon the baby. While all the gods bestowed the young lord Ganesha with gifts, there was one god who refused to look at the child. This was the god Shani, son of the god Surya. The gaze of Shani is said to cast a bad omen on which it is directed. So Shani had a very good reason to not look at Ganesha. But Parvati insisted that Shani must look at the face of his ‘nephew’. Very reluctantly, Shani finally agreed and cast a quick look towards the young lord Ganesha. Almost immediately the child’s head fell off, in some stories it turns to ashes. Parvati was devastated and it was lord Vishnu who came to her rescue. In one quick movement, he had mounted his vahana and had gone to fetch a replacement head. Returning with the head of a young elephant he had found of the banks of a river, lord Vishnu placed the head on the lifeless torso of the boy. The boy was brought back to life to the joy and utmost relief of both Shiva and Parvati. And so the naughty, fun loving god Ganesha was born. Yet another story mentions a completely different reason for the birth and subsequent replacement of Lord Ganesha’s head with that of a young elephant. But in this case the story starts a little differently. Aditya was one of the sons of the great sage Kashyapa, one of the seven great Rishi or sages. According to the story, Shiva, in a mistake, slew Aditya by cutting off his head. Kashyapa cursed the great lord Shiva that the same fate would befall the first born son of Shiva and when that happened, the child’s head would be replaced by the head of Indra’s elephant. And so, Ganesha, the elephant headed god was born. In another twist to the same tale, when Shiva cut off the head of Aditya, He replaced it with Indra’s elephant’s head and brought him back to life. Kashyapa was very incensed by Shiva’s act and he put a curse on Shiva. According to the curse, the first born child of lord Shiva would be born with an elephant head. In the case of this particular story, Ganesha was already born with an elephant head unlike other stories where he acquires his elephant head later.